Two of Mount Royal University’s own are expected to reach new heights next month. Professor Trevor Day and fourth-year health sciences student Michael Tymko will embark on a high-altitude human physiology research expedition to Mount Everest next month. “Scientifically, this is an incredible experience,” Day said. Starting April 21, Day and Tymko will spend six weeks working alongside a 25-member team of investigators from six countries, led by Dr. Philip Ainslie from UBC’s School of Health and Exercise Sciences Okanagan campus. The group will start in Kathmandu, the capital of Nepal, before trekking to the Ev-K2 CNR Pyramid Laboratory, an international research facility located near the Everest base camp. Once there, they will spend three weeks carrying out 12 to 14 experiments on brain blood flow, pulmonary function, cardiovascular function, control of breathing, sleep and acclimatization. The goal is to better understand how the body responds to low oxygen levels. All the investigators will be helping with each other’s studies, either as co-investigators, subjects, or both. 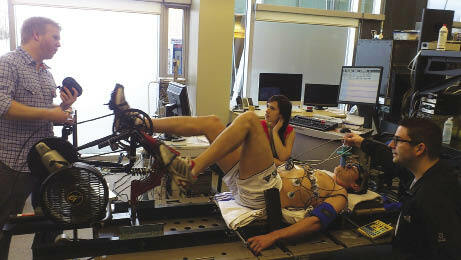 The team is nearly finished with baseline tests, started in late February in Kelowna. The plan is to repeat the tests at the Pyramid Laboratory, 5,050 metres above sea level, and compare them to the results from Kelowna, elevation 344 metres. The oxygen in the atmosphere at the hut is just over half that of Vancouver. His research will compare anterior (front) and posterior (back) brain blood flow in response to changes in blood gases and various pharmacological interventions. Day praised Tymko for his contribution to the expedition: a portable exercise bike that can be transported up to the hut in pieces, re-assembled, and used in at least three studies investigating cardiac, lung and brain function during graded exercise stress at high altitude. “It was a bit of a journey just because there’s no guidelines really on how to build one,” Tymko said. According to Day, Tymko has a knack for building things, a talent that surfaced during their research work together last summer and again last semester when he built a one-of-a-kind lower body negative pressure box. “I don’t find it too difficult. It just takes patience and a lot of thinking,” he said. Tymko said he is heading into the expedition nervous about the inevitable mountain sickness, but more excited about the trip’s networking and educational opportunities. The pair will be back in Canada the first week of June. Track the team’s progress during the expedition by visiting Day’s blog at stressfiles.wordpress.com.